The data for road casualties posted by the Department For Transport yesterday (September 27th 2012) at http://www.dft.gov.uk/statistics/releases/reported-road-casualties-great-britain-annual-report-2011 are full of disappointments and minor excitements, spread across 145 Excel files. The table that caught my dolefully morbid eye was a list of English local authorities, each with numbers of people reported as killed or seriously injured estimated “per billion vehicle kilometres travelled” in the years since 2005. My link gives the context but here is the table, ranked in descending order of number of “KSIs” (people killed plus those injured seriously enough to have been a hospital as an in-patient). I note that London leads the Danse Macabre, with Hackney (where my cycling son lives) featuring in 4th place. Bristol (where I now live) at a fairly anxious 45, while all the “safest” counties, North Somerset, Bath and North East Somerset and South Gloucestershire (149th , 150th and 151st respectively) are those immediately adjacent to Bristol. I’m pleased to say these are the places I do a lot of my cycling these days. Across the whole of England, there was a 2% increase in KSI’s in 2011 over 2010, but in the longer run, between 2005 and 2009 things had been getting better. So maybe next year will bring better news. The Department for Transport have issued some parallel guidelines for cyclists and for motorists, having spotted that they are often the same people. Use your indicators – signal your intentions so that cyclists can react. Avoid driving over advance stop lines – these allow cyclists to get to the front and increase their visibility. Follow the Highway Code including ‘stop’ and ‘give way’ signs and traffic lights. Always look out for cyclists. Especially at junctions. Eye contact can be useful. Always use your indicators. Make it a habit, not a decision. Give cyclists much more space when you pass. Before opening your car door at the roadside always look for cyclists behind you. Advanced stop lines are for cyclists – not you. Stop at the first line and don’t move forward until the lights are green. Look around and behind you before every manoeuvre. Eye contact can be useful. Always use lights after dark or when visibility is poor. Be seen. Light, bright or reflective clothes always help. Camouflage never does. Pavements are for pedestrians – not you. Stop, dismount and push your bicycle considerately. Here we are at another junction. It seems to be a choice of straight on or right as we come out of the one-way Penn Street, with Castle Park’s trees away on the opposite corner. We notice the late arrival of a lead-in lane to the ASL with its cute little diagonal and realise that the bus and cycle lane we have approached in has kept us too far over to the left to be able turn right safely on this phase of the lights. If we have a look around while we wait, the junction has some curious cycle markings, in a pen made of bollards and small islands. They are hard to distinguish from here. Coming back to that ASL, we can look across and see roughly what the markings are. Two very short cycle lanes hanging off give-way lines. With a cyclist making a right turn while the lights are against us, they don’t seem much use to him. I don’t think they are meant for us either. It’s a puzzle. The mystery deepens as someone else appears, apparently from nowhere, while our lights are green. He is clearly on a very strange trajectory. It soon becomes clear that he knows where he’s going, even though his route is a bit irregular. Right behind him another bold pioneer trundled off in the same direction, with the same contraflow instincts. Bristol is truly a City of Anarchists. What I hadn’t realised until I got home and checked the Council’s special map is that immediately beyond our lights on the left, obscured by the large buildings of Cabot Circus there is a short fragment of official traffic-free cycle route. This careful cyclist has hopped onto what I thought (wrongly) was a pedestrian area and is travelling east towards Bond Street South. We would take a left turn just after our traffic lights, up a bit of dropped curb, to follow her. Things are starting to make sense. I don’t remember seeing a sign, but never mind. There are lots of other mysteries still to solve without worrying about signs. And over there, another lost soul, heading across the pavement in the general direction of Castle Park, with some traffic to navigate before he gets there. Those bollards and cycle lanes still don’t make any sense. They don’t look any more rational from this angle do they?. I took this picture from over on the park corner, looking north east. The road surface didn’t look too good either. I decided to try using the cycle lanes. It was a stupid decision I know, but the day was clear, the traffic wasn’t especially heavy and I was feeling confident. My first run was from the south. I came down Lower Castle Street and used the left hand lane of the two you can see in the picture immediately above to make an elegant but very eccentric right turn across where the bus is. Crossing the all-clear roadway I rolled onto the traffic free cycle route and looped around to come back for a run at the other lane. When the road was clear I was able to cross it, navigate the full length of the lane, pause at the give way, and then pull away to my right to join Broad Weir. Broad Weir is where the man in the previous picture had been on his way to. Neither of my two journeys seemed to have much practical purpose. The first one felt distinctly exposed and counter-intuitive. I wonder if anyone ever uses it? The second just felt frivolous. 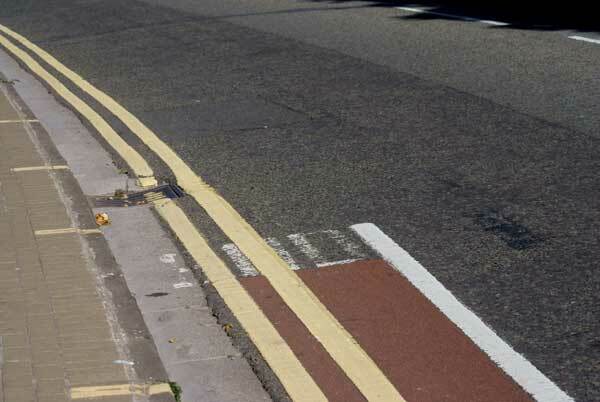 What I learn from this set of blogs so far is that despite the attempts of the Council to provide help for cyclists in awkward places, there are at least a few cyclists who make up their own versions of how to make their way around. To my shame, they all seem a lot more contented and confident than I felt, pedantically trying to find out what the “right” thing to do was. And I still don’t understand these stranded, truncated cycle lanes. Maybe the shoddy road surface indicates that refurbishment and a big fat traffic roundabout is on the way to blast them into oblivion? There will be another journey of discovery coming along soon. Do come back. This is what happens to too many cycle lanes. The paint, the money, or the easy access runs out and the false friend lets you down, again. Even the redundant sign that says “END” has faded away. And mind that sunken rain gulley. But off you go, unshielded, to the next set of lights with not even a lead-in lane to get you safely past a queue and into the ASL. If you stop to wait for the next green and look to the right, there is a one-way street feeding traffic onto the road you have just come down. It looks a handy exit from here if you could get to it and there does seem to be some kind of cycle facility. Maybe even a contra-flow lane? But it’s not obvious and there’s no sign to help. While you dither, someone avoids the confusion by sailing on across the junction, on the pavement. Much safer. Only four pedestrians to navigate and by the look of it at least one of the four has seen her coming. … could just be… er, well this is on your side of the road, offering some good, if slightly illegible, advice. Then this happens over on your right when you weren’t paying attention. A pioneering cyclist has turned right, across the end of the one-way street in front of a bus coming out, ignoring the no-entry sign. He seems to know where he is going. … and a taxi invades your ASL, so things are getting worse. Maybe it’s time to dismount and have a look round? Yes! That paint beyond the pedestrian crossing brings the good news that you can ride your bike down the side of that one-way street. Progress! And beyond it, paradise! A cycle lane that isn’t just advisory. It has a coloured surface and a solid white line. Steady on the turn though, it looks a bit tight given the proximity of the on-coming traffic. Not too bad at all then. I’m not sure where you’re going, but you’ve got a clear cycle path to follow, so why not? However, if you could have seen your route from the other end you would have noticed that your new False Friend guides you alongside a row of parked cars and you might find that oncoming traffic is not too worried about crossing your protective white paint. And guess what? Looked at from the section you are just coming down, this dodgy cycle lane ends in the middle of a junction, with nowhere to go. This is how the story began. And so it continues: one lane ends and another (is it another?) appears out of (and in) the middle of nowhere. There’s another half-journey coming along soon, so stay in touch.